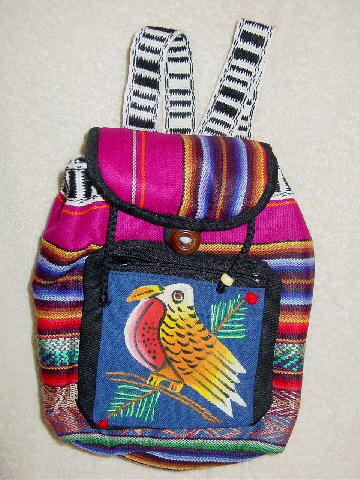 This little Latin American-made fabric backpack/purse has a black drawstring closure with a yellow bead at each end. 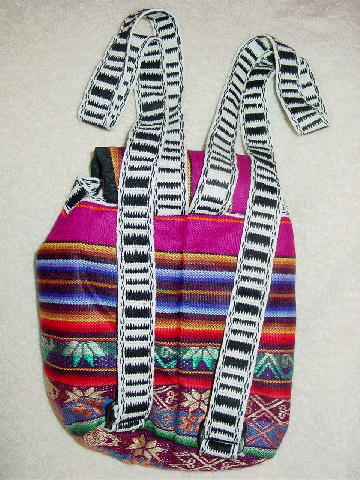 The front has a zippered pocket. It has a design pattern in silver, blues, and orange thread. It's in magenta, white, greens, blues, red, yellow, and brown. The back has 32" long black and white adjustable straps. The fabric has some padding to it. It's from a stylist's inventory, and was used for pictures for a child model's portfolio.